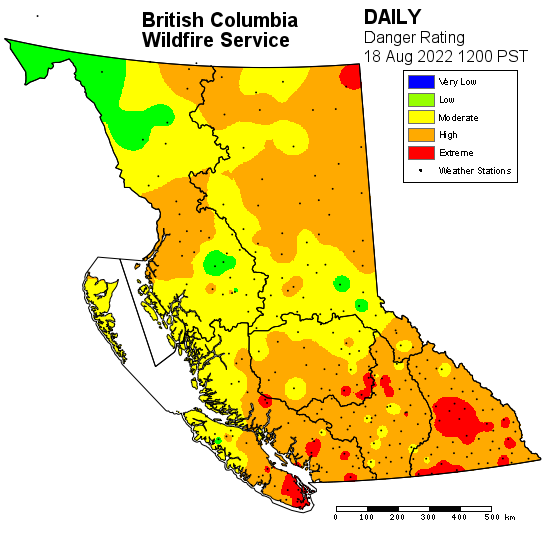 The Fire Danger Rating is calculated in BC from May to November. The current Danger Rating level is provided on British Columbia Wildlife Service map. If you are unfamiliar with Woodlot location in BC, please visit the Contact Us page to view map. You can zoom out on the map to see location in lower mainland and province. Please be very careful when visiting the woodlot or any forested area. Report any fires The danger rating map to the left is provided via the BC Wildfire Service website and is updated by the Fire Service at approximately 14:00 and again at 18:00 PST on the date indicated on the map. To report a wildfire, please report it to the BC Wildfire Service at 1-800-663-5555 or call *5555 toll free on most cellular networks. Alternately, you can report a wildfire to 9-1-1. The Trans-Canada Trail passes through the woodlot. This trail spans the country from coast to coast. This section allows hikers to experience a working small scale sustainable forestry operation. You will observe a typical Coastal Western Hemlock biogeoclimatic ecosystem at various stages of growth. You can observe a variety of wildlife species typical of this area. For a complete list of species visit our “About Us” page or download our Woodlot Species Account. Motorized recreation is not permitted. We ask you to help us protect the woodlot by reporting any vandalism or reckless behaviour via phone, fax, or e-mail. Please report directly to the appropriate authorities. The woodlot is crown land. Although Woodlot 0007 is primarily a training and research forest, we encourage the general public to enjoy the woodlot for recreation. We ask that you respect the forest environment by staying on roads and designated trails. Please keep pets under control, to minimize disturbance of wildlife and other users.